Russian experts say that due to a six-year low in oil prices, Russia's economy could contract by up to five percent in 2015. Moreover, the situation drastically differs from the 2008-2009 crisis when Russia was not as dependent on oil prices or under sanctions. In the first quarter of 2015 Russia's GDP will contract by more than one percent. However, if the cost of oil remains at the level of $40 a barrel, Russia's economy will shrink by five percent over the course of the year, according to the Ministry of Economic Development. In the first week of 2015 alone the price of oil fell below $50 a barrel, losing more than 11 percent of its value. The price drop occurred after representatives from the United Arab Emirates announced that OPEC does not intend to reduce production quotas. Consequently, on January 15, 2015 the price of a barrel of Brent fell to $47.65 during trading at London's International Currency Exchange. According to Alexander Prosviryakov, a fiscal and commodity consultant at PwC Russia, the magnitude of the Russian economy’s difficulties will directly depend on the dynamics of oil prices. The principal part of Russia's budget revenues comes from the sale of energy resources with the 2015 budget based on a preliminary estimate of oil prices of $100 a barrel. Alexei Kozlov, the chief analyst at UFS IC, believes that if oil prices remain at $50 a barrel in the long term, then we can expect Russia's economy to contract by five percent. "The dynamics of Russia's GDP is greatly dependent on oil prices, but it is not the only factor," says Sergei Khestanov, professor or finance and banking at the Presidential Academy of National Economy and Public Administration. "The exchange rate, fiscal pressure and capital flight also have significant influence." Another factor, in Khestanov's words, is the effect of sanctions, as well as the probable lowering of Russia's and many Russian companies' ratings by credit agencies. As a result, GDP could contract by up to 5.8 percent in 2015. "The fall in oil prices will partially be compensated by the ruble's devaluation," adds Khestanov. Russian experts believe that Russia experienced a similar crisis in 2008-2009, when the price of oil fell from $120 to $40 a barrel. However, Russia's economic and political situation was different back then. "Our country was not under harsh economic sanctions and also today's market is oversaturated with oil," says Daniil Kirikov, a partner at the vvCube Group. According to Khestanov, the Russian economy's dependence on oil grew by following the so-called "Dutch Disease" Model, which signifies a greater reliance on natural resources for economic development coupled with a decrease in other areas, such as manufacturing. "The decline of non-raw material industries began at the beginning of the 2000s and kept progressing," says Khestanov. "That is why the dependence of Russia's economy on oil prices grew." 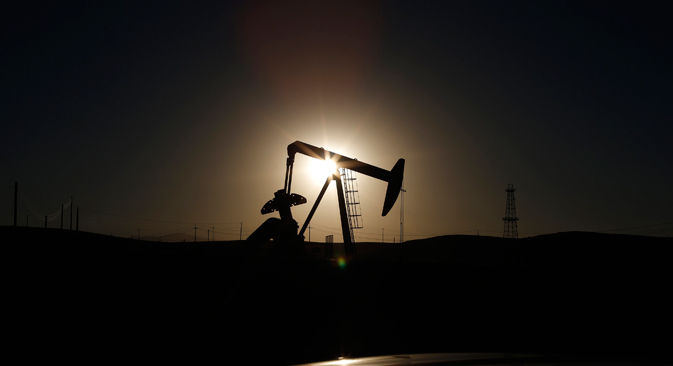 Furthermore, in the opinion of Finam Investment Holding analyst Anton Soroko, the current decline in oil prices is taking place against the backdrop of a growth of fuel production in the U.S. This is due to a boom in shale extraction, as well as low growth rates in the consumption of energy resources. "The world economy is growing at a different pace compared to 2009 when investors were full of hope," says Soroko. He says that the growth of demand in China does not replace America's new extraction capabilities. "In 2008-2009 investment activity in the Russian economy was in good shape, particularly regarding foreign investors,” says Soroko. “Now there is practically no foreign money in the country, which is why the fall in oil prices has had a bigger effect on the value of the ruble." In Alexei Kozlov's words, the Russian economy's dependence on the cost of hydrocarbons is significant. However, unlike the situation of 2008-2009, there are additional factors today such as pressure from sanctions, inflation growth, a substantial increase in geopolitical risks and diminished expectations for economic recovery.